Dangerous words, but well, I have a plan of sorts. It’s about Richard Armitage. I know that’s a shocker, but I thought I would tell you that upfront. His 40th birthday is coming up, and Calexora has a birthday book planned for him. The messages I’ve read so far are lovely, and I love the possible covers (hope it’s the French poplars). If you want to be in on that, get her a message by July 8th. 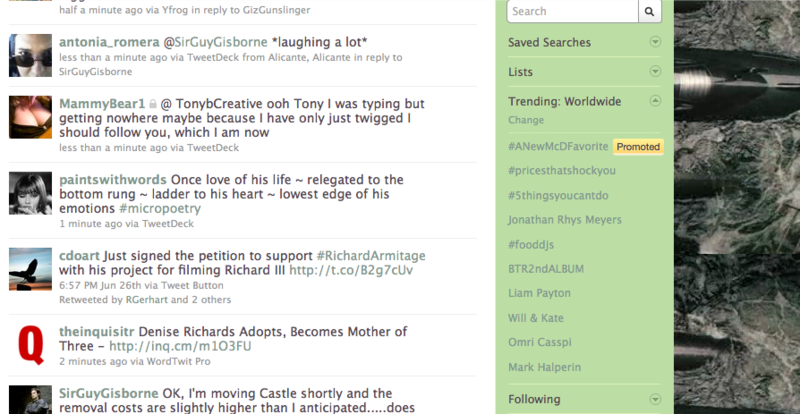 But before Armitage Day, wouldn’t it be cool if he were trending on Twitter? He never has trended that I’m aware of. I asked Ali at RichardArmitageNet.Com (aka @RAnetdotcom) and she doesn’t remember him ever trending. Oh, you don’t do Twitter and have no clue about trending? Well, maybe you need to open an account, and trending means whatever is the hot topic (see right sidebar on my Twitter home page). If you don’t have time to take on Twitter, just do it for this and then you can bail — no one will think anything of it. You know how many widow accounts are on Twitter?! Believe me it’s no biggie. I’m contacting all the RA websites — the ones I know are on Twitter — and asking them to be in on this too, and of course I’m contacting all of the RA bloggers I know. We’ll just need to set a date and have a theme of sorts so that this doesn’t come off as lame. I’m thinking the date should be sometime after Captain America but before August 22nd, and Strike Back promotion will also be in the mix. That timing surely can’t hurt, but the truth is so many things that trend on Twitter are planned trends. Take Captain America for example. That will trend (if it hasn’t already), and it’s surely due to all of the hype by pr machines at a certain time. Why can’t RA have some hype? He’s definitely worth it, and this could be fun. And so much better if fans do it than a publicist. Hey, are we the Armitage Army or not? :D Oh you don’t consider yourself part of the Army? Too bad ’cause it’s fun and not even close to violent. Yeah, we’re thinking about it, Rich. Count me in! Just tell me the day to start the tweeting tidal wave!…. Well, since you got me to tweet …. :) Count me in. But you’ll have to tell me what to do, exactly. Surely Richard Armitage can have some hype. As for the theme, how about “Fell the Armitage Effect”? @calexora, bummer on the cover. I love that picture, and it’s yours. Seriously, I really like that picture — book or no book. The key IMO is to not only have a good tag line, but to have a series of articles that really do make the case for him being interesting, and no, I don’t mean a bunch of gushing from us about how great he is. How BORING. The toughest part is being objective ’cause in case you all haven’t noticed I and most of you are far from objective any longer. LOL! I get what you mean, Frenz. I just think we could explore the characters he has portrayed, regardless of which theme we are going to use. Frenzy, I am in on it, but like Servetus would need a bit of help what to do. I am on Twitter, but a bit overwhelmed about what is going on there and possible with such short messages. Would it be possible to lead a bit of the hype in the direction of the Richard III-petition ? (Just because I am pre-occupied with that idea right now and would really love to see us fans making a difference in that regard. Let’s certainly do Richard III, and I’m working on that now. But that is not a subject that will pique the masses, so for the trending project, I don’t think it will work. The key to getting something to trend (other than it just being a naturally hot topic,e.g., jonathan rhys meyers’ suicide attempt) is to have a hashtag to go with it, so that people trend the hashtag. That’s how you easily find things on twitter by the way. A hashtag is anything that begins with #, and they can be assigned as anyone sees fit if they are not already taken. Or then again, an already established hashtag can be co-opted into something else. LOL! Count me in :D. Just asking..have you contacted Armitage Army and C19 forum moderators? Those forums have a big group of participants and could help, although don’t think all of them might have a twitter account so that would include some ‘teaching’. I like ‘feel the armitage effect’, although I associate it to the effect he has on us women, in part because of his looks, in part because of his talent, not sure if non-fans would feel like we are pushing our love on them. I think it be useful to make a list of key words or ideas that we could write our tweets around. I think “feel the armitage effect” might be a great piece to direct some people toward. yes, women. LOL! But you’re right that it cannot be the sum of what we’re going to talk about. Love the idea of key words. Perhaps we can just brainstorm about that. I’m in the process of sending a note to one helluva a distribution list, and many will be on bcc so that the emails are not divulged. I’m not sure exactly whom to send the C19, and Army site emails to, but I’m looking that up now. Will probably send to administrator and all the moderators. I meant to say I’m in the process of drafting a note. Not quite ready to send it yet. I’m registered on the Army site, so I could send the moderators a PM on your behalf (when your ready). What is also good to keep in mind is you can ask your followers to retweet a statement once we figure out what it will be. LOL. That retweeting alone would significantly boost a hashtag, and hopefully would leverage your followers’ followers and so on and so forth. But it has to be clever and certainly pithy. If anything sounds the least bit pedantic, forget it, it’s dead. Pedantic is a curse on Twitter. Some people learn that the hard way. To give an example, and I hate to use this one, but it’s really a great one. Charlie Sheen is not pedantic, but I have to give it to him that he’s clever and funny even if he is on his way to hell while doing it. Are you sure that Richard would like that kind of “publicity” on twitter ? Just asking…. Not sure what kind of publicity you’re thinking of? If you mean like Charlie Sheen,i.e., a buffoon? No, that would not be appropriate. But like Charlie Sheen being clever and pithy? yes! and there is a way to do this without it making RA silly or buffoonish. It just needs to be thought through hence my post. This is a terrific initiative, thank you. I’ve noticed that many of the trending topics have a generic title (eg #loveRichardArmitage) that allows people to put in a reason (eg I love how Richard smoulders #loveRichardArmitage) and then a link or two (eg I love how Richard smoulders http://bit.ly/APSdj #loveRichardArmitage) as well as the hash tag. Twitter apparently loves the links as well as the hash tag and this helps it trend. You need at least 2000 tweets at once to make a topic trend internationally, so it might be more feasible to try and make it happen country by country over a 24 hour period. It’s really difficult to keep a topic trending over any length of time – 5 minutes is an achievement! But if we could make it happen for 5 minutes in a number of countries in different time zones in a 24 hour period, that would be pretty fabulous. Y’all are makin’ my head spin. I’ll cheer ya on! Great idea!! I’m in – but I think that you have to keep it simple – if you are trying to get a tag to trend, that will be difficult if it is not simply #RichardArmitage ido you not think? It’s a bit like fanstravaganza but on Twitter, no? That said, i would be amazed if it did trend very highly e.g. in the US or worldwide. Even when Spooks 9 started, it was only occasionally possible to get it to trend – but it did, at least in UK for a short period. But did he not trend when The Hobbit cast was announced? So I guess I would be interested to understand what your objective is in a bit more detail. And I think that you have to tie it to some existing publicity don’t you? But happy to help in any way I can. Kap, Definitely have to keep it simple, and YES! it must be tied to existing media. It’s a good idea to take advantage of whatever might help, and it seems in between CA and SB, and who knows some more Hobbit media, we have a shot. 2000? Is the number really that low to trigger Twitter? It would be great if it were, but somehow I wonder if it is. I really don’t know. Don’t underestimate how hard it is to get 2000 tweets going at once. We held an event in my city and managed to get it trending briefly with a few hundred tweets over an hour, in the middle of the day. Time of day, geography, number of other topics at that time etc as well as the number of tweets on your topic all play a part in which topic trends at any point in time. I found the 2000 tweets guideline originally in a 2009 source, but it seems that as twitter has grown in popularity, the diversity of topics apparently means the 2000 number is still about right. But even so – 2000 at once is a big ask! When a group of 50 Jane Austen fans wrote a novel on Twitter earlier this year, something that was grabbed by the the Times, BBC and blogs and media globally, we created a simple hashtag: #A4T. It was all that was needed. I think simplicity is your key. #R3rd #RA4T and so on. Goodluck. I know Bccmee schedules her tweets I wonder if that could help us with our efforts too. Kap beat me to it but I think plain #RichardArmitage coupled with #CA or #SB would be most efficient. I was going to suggest #hero but that pertains to his characters perhaps #talent is plain and simple and speaks to all genders too. What’s funny as I decided today to post a fanvid a day leading up to his birthday for some of the newer fans out there and on the fly made #RichardArmitageAwareness trouble is that it eats up characters. So it seems we have to time this carefully & wondering if a weekend would make it easier? #RichardArmitage is often confused with an American politician and it eats up the characters. Keep it short. Also if you use #SB or similar, it restricts it to a reference to only one of the roles that have been acted. Yep. We’ll definitely have to think this through. If we could have something up and running by July 22nd (gee isn’t that a significant date too. ;-) ), it would be great. That way we have a whole month to get it right. Ok the first time i came to this post, i saw the pic, grinned and went away :) So i am reading it now. Thanks for explaining trending btw, i didnt know about it, new to twitter and all. Count me in! :) This will be fun. I know #RichardArmitage ( #actor ) eats characters and #SB limits it to #Porter or #CA to #HeinzKruger but unless you are a fan RA means nothing. Same with the short #A4T (does it mean Austen for Tea) unless you know to look for the hashtag I wouldn’t have come upon it. I’ve looked for other other actors tweet accounts or recent activity by simply writing out their names. The #CA or #SB would become useful that out tweets would show up in that list too & possibly gather new fans? Could we use the opportunity to tell them he’ll be playing in the hobbit … The realist in me thinks he will get very little notice outside the RA world for those roles. i’m thinking, what if we promote him as the new villian of James Bond movie?? One he said that he ‘ll love to do it, perhaps for time he can’t, but will be a chance to put his name in the map. As usual, I’m on the run, and for those who don’t know it, I despise typing on my phone, so I’ll probably make this short. I like the thinking so far about the hashtags and keeping it something that is easy for people to relate to.That is a must, but Mesmered hit on something key. Media picked up on the Austen tags. Not sure we will get that nor do we want it ’cause we know how it will be constued _- a bunch of idiot women in the Armitage Army. LOL! To all, you are sharp, so I assume there will be something clever to come out of this. I certainly don’t want us to look like the Blogilow group nor the baleheads – no offense to either, but we’re not them. Wish I could participate more at present, but my thumbs are smarting. This is the longest piece I’ve ever typed on my phone! RAFrenzy,what I meant to say was- isn’t this “The Armitage Protecting Mode” taken one step further into “The Armitage Promoting Mode” ? Please don’t get me wrong, I’m all for Richard getting his well-deserved acknowledgement and success- but I’m really in doubt, if he would like it done in this way. I mean, there’s a reason why he’s not on twitter- he’s definitely not an attention- seeker, as far as I can judge. I’m sure CA and TH will get him noticed in the right places anyway- with producers, directors and such. @N, when I can get somewhere to type comfortably, I’ll explain my thinking, but in the meantime, I appreciate you explaining what you are thinking. If Richard Armitage is not on Twitter, will he notice if he’s trending? :) I can’t imagine that he could possibly care about whether we did or didn’t do this, which is part of why it could be a great idea. It will happen, non-fans may be encouraged to find out who he is, and then it will all fade into the ether, except at the Library of Congress, I guess. Admitting that I know nothing about how Twitter works and have now tweeted for a grand total of two weeks and 61 tweets or something like that, I like the idea of the “Richard Armitage” + verb thing attached to a fairly generic hashtag. “Richard Armitage stirs me” + #richardarmitage or something like that. It would allow the tweeters a significant amount of own input, and it could happen at several times a day, one would think — so it would also be interesting for us to read, not just an attempt to gain attention of non-fans. IMO if RA ever finds about this, I don’t think he’ll mind as long as it isn’t silly or ‘too shallow’ tweets. Publicity about his work and his talent can only be good even if little, which I think it’ll be, because I think it *will* be difficult to have him trending more than an hour, if we can accomplish that. I think our goal could be making #RichardArmitage trending, if someone confuses him with the politician, once they read the tweet or see (if there is) the link attached they’ll know it is the actor we are referring to, besides isn’t it one of the motives, for those who don’t know him or just know the politician, to know about him? Our second thought should be what key words or ideas we will be tweeting about, both cool and descriptive of his work and awesome talent. Brilliant idea. Just let me know what I have to do and when and I will attempt to get to grips with it all. Thank you. Phylly here! Sorry but I was incommunicado at my cottage for the Canada Day weekend. I am definitely in on this idea. I never know what to Tweet so just let me know what we all decide. Maybe you could put some of the ideas to a vote? Happy 4th of July to you and any other Americans here. N, I haven’t forgotten that I need to address this issue. Will probably do it in a post soon.